In today’s Google Webmaster Office Hours, John Mueller was asked a question about whether or not it is okay to serve different HTML and content to different browser types, such as serving something completely different to Chrome users compared to what Safari users see. In micro-optimization, there are some who will optimize for different browser types but this isn’t something that generally impacts rankings directly, although it can definitely cause ranking issues if done incorrectly. And if it is done bad enough, it could be seen as cloaking, especially if the content isn’t similar. Generally speaking, I’d try to minimize this kind of differentiation for individual browsers. It’s important for us that the primary content of these pages is equivalent, and past that, it is essentially kind of up to you how you want to handle that. We see that a lot with a desktop page versus a mobile page and maybe the mobile version of the page is completely structured differently but the primary content, the reason for the page is still the same. And that’s kind of the important part for us there. 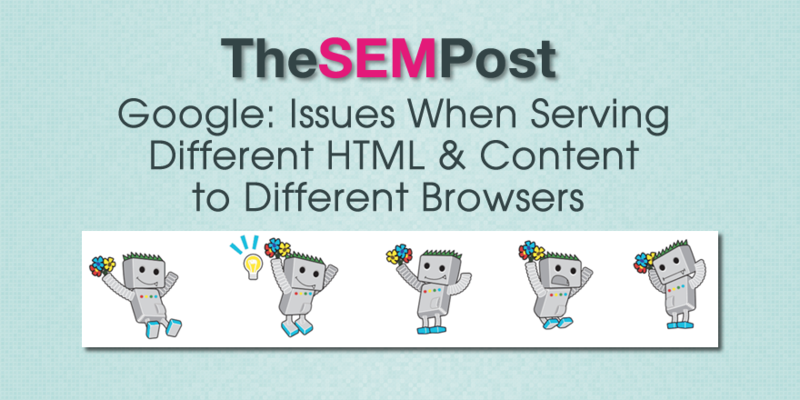 The tricky part you might run into there is with regards to Googlebot, it’s a lot harder to test what Googlebot actually sees or what individual users sees, if every browser sees a slightly different variation of the content. So kind of the maintenance, the testing, that’s a lot harder. Also caching can be tricky here if you are serving a different version of the HTML for all different browser types, then that essentially means that no cache in the network side between your site and the user can actually cache this content completely because everyone sees something different. So there’s some technical things you need to watch out for with regards to making sure it’s actually usable, but in general it’s fine from our point of view, we call it dynamic serving for mobile stuff, we have a help center article, a developer site article on dynamic web serving that gives you more information on what you would need to do on your server to kind of let us know this is dynamic serving. Bottom line, yes it is fine to do, but go ahead with caution and ensure you aren’t causing any issues with how you are implementing it. And for best practices, make sure you read the available documentation for dynamic serving.